In our previous post on Secrets to Making Spam Musubi, I talked about the type of rice (short grain) and type of Spam (regular, NOT low-fat) to use in making this perfect Hawaiian meal-to-go. Now I want to talk about the 3rd major ingredient: the nori (Japanese dried seaweed). In the Asian aisle of your local supermarket, you will probably be able to find Japanese nori for making sushi. It is extremely flat, slightly bitter to the taste, and tough like construction paper. This type of nori may be great for making sushi, but it is not so good for Spam musubi. Nori for sushi has to be tough in order for it to stand up to the rolling, pressing and cutting involved in making the maki-zushi rolls that most people call sushi. But it’s okay, because usually these rolls are cut into chunks which you can pop in your mouth in one bite. Unless you eat like Joey Chestnut, you won’t be able to fit one of these Spam musubi in your mouth in one bite. Normal people take several bites to finish a Spam musubi. Since sushi nori is so tough, when you bite into it, it will push the rice and Spam out the back end, creating a sticky mess. What we need is a seaweed sheet that is tough enough to hold everything together yet brittle enough to break off when bitten. 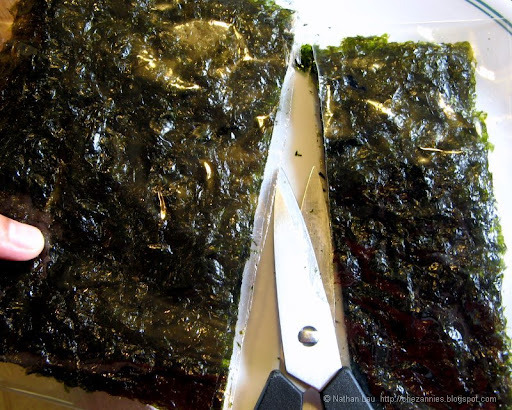 SECRET #4: Use Korean roasted seaweed instead of Japanese sushi nori. Korean roasted seaweed is thinner and more brittle than Japanese sushi nori, so that when you bite into it, it will break off instead of squeeze together. I think that the flavor of Korean roasted seaweed is better, too – sweet and salty, not as bitter. Step 5: Cut the seaweed sheets into strips of even width. A single, whole seaweed sheet is large enough to wrap two or three Spam musubi. You need to cut that sheet into strips that are as wide as the Spam slices. Most people would take the sheet out of the package and cut them up. But because the Korean roasted seaweed sheets are so brittle, you will get flakes of seaweed all over your kitchen counter. Here’s a trick to make cutting seaweed sheets up a little cleaner. SECRET #5: Cut them up while still in the package. If don’t use up all the strips of seaweed this time, you can just save the rest in a Ziploc bag for later. Or you could cut the unused seaweed into smaller, snack-size strips and munch on them.By the way, before you cut through package of seaweed sheets, watch out for the little packet of silica gel beads in there. You do not want to cut through that, or else you’ll have tiny clear beads all over your kitchen table. Don’t ask me how I know. Step 6: Assemble the musubi. 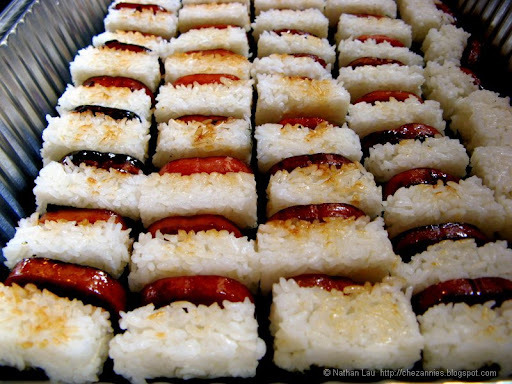 SECRET #6: Assembling will be much easier if you use a special Spam musubi mold. I got mine from Long’s Drugs in Honolulu. If you don’t happen to live in Hawaii or know anyone who can get you one from there, shoot us an email (see the About Us page)and we’ll see if we can get you one. Lay down a strip of seaweed. Place the mold across the middle of the strip. Lay down a slice of fried Spam. Scoop in about a cup of cooked rice on top of the Spam. Push the top of the mold onto the rice and press down firmly. While holding the top on the rice, pull the mold up off the musubi. Lift off the top. Wrap the seaweed strip tightly around the musubi.With enough practice, it only takes a minute to wrap one. Set the finished Spam musubi aside and repeat until you’ve wrapped them all. If you’re making a lot for a party, you can cut each Spam musubi in half. Enjoy! >I've just found your blog and have subscribed. Wonderful to see the recipe for musubi as I used to make them by hand with umeboshi in the centre. Da guys were impressed that a haole could master "the art"! >I've also used the empty spam can as a mold when I've been in a pinch, FYI. - Still one of your biggest fans! >randomly found this post after doing a search for pandan waffles. i have always felt frustrated making spam musubi!! but after reading your post i feel so empowered to try again. thanks for the *tips* e.g. 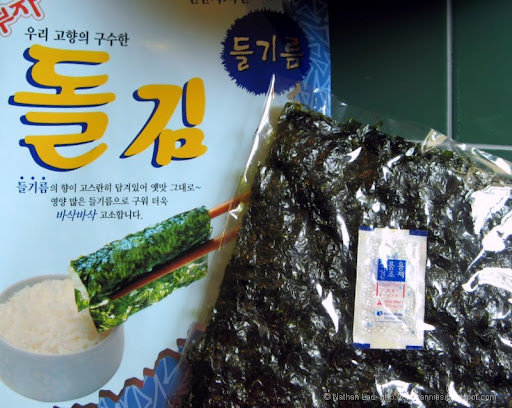 korean seaweed and especially the youtube clip of actually wrapping one. @Vivian – I love a musubi with ume in the middle…especially if they're ume from Wakayama. @Sonya – thanks! I've always been scared of cutting myself when using a Spam can to make the musubi. @Lia – you're welcome! I hope you find our site useful and come back often. >Big mahalo for turning me on to Korean roasted seaweed! I was at the Asian market last night and decided to look for it after your post piqued my curiosity. Hoooo, da buggah even mo ono den ajitsuke nori! Thanks for the tip about using Korean nori. Was always wondering which type to buy since there are literally dozens of types. Good tip about using shoyu and sugar. You do best. SWIFT Theme by Satish Gandham. 58 queries in 0.843 seconds.